The holy, glorious and right-victorious New Hieromartyr and Equal-to-the-Apostles Kosmas Aitolos (also known as Cosmas Aitolos, and St Cosmas the Aetolian) was born in 1714 in Mega Dendron, Aitolia, Greece, to a father who was a weaver and a devout mother. He attended public schools, but was tutored by an archdeacon. He taught and then attended a school on Mt. Athos. He became a monk and later a priest at Philotheou Monastery where he remained for two years. After a time, he felt a calling to do missionary work in Greece, especially in the remote areas where there was a lack of churches and priests for the many unbaptized adults. As an aftermath of four centuries of Turkish oppression in Greece, Kosmas received the patriarchal blessing in 1759 to travel wherever needed, for however long, with complete independence, to breathe life back into Christianity in Greece. Kosmas travelled in Greece, its islands, and Albania for 25 years, founding over 200 schools, as well as charities and rural churches. He travelled by foot, by donkey and by ship. When he came to a village he would ask the villagers to plant a large wooden cross in the village square. Then he would mount a bench next to the cross and preach to the villagers about the love of God and the Orthodox faith. The Muslims tried him on charges of conspiracy and sentenced him to hang in August 1779 in Albania. However, one account reports that he prayed and gave up his spirit before this could occur. St. Kosmas received from God the gift of prophecy, and was known to have prophesied of the telephone, airplanes, and aerial bombings. 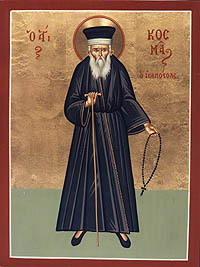 Patriarch Athenagoras glorified him in 1961. His feast day is celebrated on August 24. This page was last edited on August 11, 2016, at 02:20. This page has been accessed 49,891 times.